Azaleas and rhododendrons can be pruned as soon as they finish flowering. This is also a good time to fertilize them. Choose an acid-forming fertilizer blended for these particular plants, and be sure to follow the label directions for amounts. Learn more by visiting the Azalea and Rhododendron society websites. In California, most soils contain adequate nutrients for citrus growth, except nitrogen. One-year old trees will need 1/10 of a pound of nitrogen, while mature trees need approximately 1-1/2 pounds. These amounts should be divided into three different feedings in April, June and August. Blood meal without all the fillers is an excellent source of nitrogen, or you can purchase a balanced product that contains zinc. Spread the fertilizer evenly over the entire root area and water in. For more information, refer to the UC Pest Note on Fertilizing Citrus, and Questions and Answers to Citrus Management from the UC Davis Home Orchard website. Bees are very active in warm weather. There is simply so much pollen and nectar to collect! Sometimes, a bee colony may swarm. If you see a swarm, don’t panic. As in any other time when working around bees, remain calm, move gently, and give them their space. Bees generally swarm when they are looking for a new home. Swarming bees are loaded with food and are not interested in stinging people. Contact the Bee Guild to have swarms removed. Many home gardeners are confused about the terms “compost” and “mulch;” frequently these terms are used interchangeably, but they are not really the same thing. Here is a Comparison of Soil and Mulch from UCCE. Amend soil with compost to create soil that will retain water but still drain well enough for roots to have the air and water they need. April and May are the best time to prune camellia. Camellia should be pruned just after flowering and before new vegetative growth gets going. If you prune later in the season, you risk damaging next years blossoms. To harden off seedlings, first move them outside to a shady, wind-sheltered area for a few hours a day, bringing them inside at night. After a few days of that treatment, place them in the sun for a few hours in the morning or late afternoon and gradually increase the sun exposure. Reduce the frequency of watering, but do not allow the plants to wilt. Do not place seedlings outside on really windy days or when the temperatures are below 45 deg F.
After a couple of weeks, once the seedlings are used to full sun and can stay outside overnight, they are hardened off and are ready to transplant into the garden. We all know that lady beetles are good for the garden. Make sure you can recognize the larval stage, which resembles tiny alligators, because this life stage eats even more aphids than the adult form. Before spraying pesticides, remember that a low population of aphids can attract more lady beetles, and potentially keep the pest population below a damaging threshold. Read more about Lady Beetles in the UC Pest Note on Convergent Lady Beetles. In hot, sunny weather, the bark of fruit trees, especially when they're young, can get sunburned and begin to crack or peel. This allows tree borers and other pests and diseases to enter, which can cause significant damage to the trees. To protect exposed trees, the bark can be painted with white latex paint, mixed 50-50 with water. If you have a new fruit tree that hasn't been painted, do it now. And consider other fruit tree trunks if they have significant sun exposure. Bees are pollination workhorses, increasing garden production. Many plants will not produce fruit unless flowers are pollinated. Colorful annuals, such as Cosmos, edible African Blue Basil, and Salvias attract bees. You can also allow herbs and other plants to flower to create bee-friendly landscapes. The University of California at Davis has a garden dedicated to bees. The Honey Bee Haven website has more resources, including a list of plants they grow. May is a busy month for summer vegetable gardeners. Tomatoes: be careful about planting too soon! Tomatoes are best plants when the soil warms to 60ºF. If you're not planting in containers, you may need to wait until the beginning of June. Peppers: as soon as average nighttime temperatures are above 55° F, peppers can be added to the garden. Before that time, they can be started indoors. Make pepper more productive by planting different varieties closely together. You will get more peppers per square foot because the plants support each other and provide protection from sunburn. Plus, they look lush and beautiful. After planting, it is a good idea to remove flowers and fruit from large-podded plants the first four to six weeks to encourage deeper roots and more foliage. Learn more pepper tips by consulting our Growing Great Peppers page. Squash: both summer and winter squash varieties can be planted now, either by direct seeding or transplants. The designation of winter squash means that they have harder skins and can be stored through the winter, but they're grown in summer. Milkweeds are the required host plants for monarch butterflies. Milkweeds provide food for the caterpillar, nectar for the butterfly, and chemical compounds that make the monarchs distasteful to predators. Make sure to choose a variety native to California. The non-native Tropical Milkweed may disrupt monarch migration patterns, because of it's longer growing season, so don't plant it unless you're willing to cut it back to 6" or less from Oct-Feb. Learn more at the UC ANR blog posting on Overwintering Monarchs. If you have your heart set on tropical and subtropical plants like bougainvillea and hibiscus, planting in May will give them time to get established before the cold weather hits in the fall. Planting them in a protected area such as under eaves may keep you from having to cover them on cold nights. Butterfly populations fluctuate in response to climate and habitat conditions. Many have specific host plants on which they feed and breed. Some common plants for attracting butterflies are milkweed, lantana, buddleia, and zinnias. For an extensive list of relationships between specific butterflies and host plants, see Art Shapiro's Butterfly Site at UC Davis. Container grown vegetables can be decorative as well as good to eat. Almost any vegetable can be grown in a container if given the proper care. Eggplant, peppers, tomatoes, lettuce, onions, carrots, cucumbers and herbs do well. One of the biggest problems is that containers dry out very fast and nutrients wash away. Both are solvable. Do not use clay pots, which dry out quickly. Plastic, composite or wooden half-barrels are good, but avoid dark colors that can absorb heat. Vegetables like a roomy container. There must be drainage holes in the bottom but it is not recommended that you put pebbles or broken crockery in the bottom. Use a good commercial potting mix, not planter or planting mix. Group the containers together so they will shade one another. The hot summer sun can heat the soil to unhealthy levels. Water whenever the soil is dry. You can test by digging your fingers into the dirt or using an inexpensive moisture meter. You may have to water more than once a day. A simple drip system is easy to install and will make your container garden almost foolproof. Fertilize every week with a water-soluble fertilizer. As soon as average night time temperatures are above 55° F, peppers can be added to the garden. Before that time, they can be started indoors. Make pepper more productive by planting different varieties closely together. You will get more peppers per square foot because the plants support each other and provide protection from sunburn. Plus, they look lush and beautiful. After planting, it is a good idea to remove flowers and fruit from large-podded plants the first four to six weeks to encourage deeper roots and more foliage. Learn more pepper tips by consulting our Growing Great Peppers and Chiles page. Female carpenter bees are large, black and shiny. 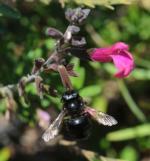 Male carpenter bees are similar in appearance to bumble bees. Both are about an inch long. Males do not sting and females sting only rarely. Carpenter bees are considered beneficial insects because they pollinate many plants and trees. For their nests, they tunnel into unpainted softwoods such as pine, fir and redwood in house or garden structures. Adults over winter in the nests, emerge in the spring, mate, deposit food in the tunnels and lay eggs. The tunnels are sealed with wood pulp and the new adults chew their way out. After the bees emerge, fill the holes with steel wool and wood filler. Apply paint to the surface to prevent re-entry. Further information is available in the UC Pest Note on Carpenter Bees. This psyllid has been a real problem in California. New leaves on the infected Eugenia look very much like peach leaf curl. The leaves also may become discolored. Thanks to the diligent work of the entomology researchers in biological insect control at UC Berkeley, a parasitic wasp called Tamarixia was released in Santa Clara County in 1993. The wasp is known to go as far as 45 miles and is found throughout the county. It is essential that no insecticide be used on Eugenia species. The Tamarixia wasp cannot do its job if it's poisoned. For more information see the UC Pest Note on Psyllids. Powdery mildew fungus is a common disease on many plants and produces a white powdery appearance on leaves and sometimes other green parts. It can be found on roses, dahlias, chrysanthemums, peas and squash. Some rose varieties are so susceptible that you would be better off removing the plant. 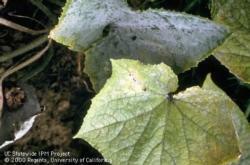 Powdery mildew likes warm days and cool nights. General tips: maintain good air circulation, remove summer veggies if heavily infected and clean up well, and plant resistant varieties next year. Powdery mildew is difficult to treat—the best method of control is prevention by planting resistant varieties—treatments are discussed in the UC Pest Note on Powdery Mildew and the UC Pest Note for Powdery Mildew on Fruits and Berries. A chemical-free way to keep roses healthy and minimize disease associated with foggy summer mornings is to prune to improve air circulation. Think of your rose bushes as large vases, with open centers. Good air circulation allows the morning dew to dry, and helps prevent rust and powdery mildew. The UC Pest Note on Roses has useful information about rose cultivation, pests, and pruning. Earwigs are third only to snails and slugs in causing plant damage. While they are beneficial because they eat insects such as aphids, they also feed on soft plants. Earwigs can do quite a lot of damage if there is a high population. They feed at night and hide in moist, tight-fitting places during the day. Trap them by putting out moistened, tightly rolled newspaper or corrugated cardboard in the evening. In the morning dispose of the paper and the trapped insects. Another method of control is a covered container such as a small margarine tub with holes cut halfway up the sides. Pour in about an inch of soy sauce and a thin layer of vegetable oil in the container and bury up to the holes. Empty as needed. Other control methods are described in the UC Pest Note on Earwigs. Our local gophers are also called pocket gophers. They make their presence known with crescent shaped mounds of dirt in the garden. Snacking on plant and tree roots as they tunnel through the soil, they are active year round and can have up to three litters each season in well-watered areas. Gophers also gnaw on irrigation lines and divert water into their tunnels, making it difficult to properly water plants. Adults live about three years. Homeowners can use several methods to control them. Locating the main tunnel is the first step. Placing Macabee or Gophinator or box traps or poison baits are explained in detail in the UC Pest Note on Gophers. Another method involves excluding them with wire fencing. Ultrasonic devices and chewing gum have been tested and are not considered to be effective. Unfortunately, the Spotted Wing Drosophila is infesting local cherry, berry, and some other fruits. Look for holes in the fruit. Once the eggs hatch, maggots develop and feed inside the fruit, causing the flesh of the fruit to turn brown and soft. Dispose of infested fruit. Information on identification and control can be found in the UC Pest Note on Spotted Wing Drosophila. Late spring and early summer are the time fire blight shows itself. Fire blight is a bacterial disease that makes plants look as though they have been damaged by fire. It attacks apples, pear and quince, most often, but can also infect ornamentals, such as toyon and pyracantha. Very often, the growing tip folds over into a shepherd’s crook shape. Fire blight spends the winter in cankers or wounds on the plant and resumes bacterial growth in the spring. There may be oozing from the canker. It is spread by insects, rain, or pruning. Infection can extend into limbs, trunks, or the root system and can kill the tree. Complete removal of any diseased tissue is critical. Dip clippers into a 1 part bleach, 9 parts water solution between each cut to prevent reinfection. The final cut should be 8-12 inches below the diseased area. The UC Pest Note on Fire Blight contains photos and more information.